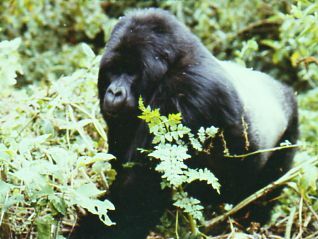 I've been waiting for you to tell the story about when we were touched by a Silverback Mountain Gorilla in Rwanda. Like I said, I've been waiting. And waiting. And waiting. And then you told the story about that toy gorilla in Nepal. That was cute, but let's get to the real story about REAL gorillas we tracked in Rwanda. Now that I have a way to contribute, I will. I think our encounter was so special. I guess I should start by saying that we were in Rwanda before the civil war. The six of us got permits to see mountain gorillas for two days. This meant observing one family for an hour once we had found them. When we arrived at Parc National des Volcans (Volcanoes National Park) in the Virunga Mountains, we first had to sign in, then read two pages of gorilla etiquette and rules of tourist behavior. The hike was hard, but we were lucky and found our "family of the day" after only about an hour of slogging through the rainforest. Females and young ones were feeding in the trees and bamboo all around us under the watchful eye of the silverback, Ndume. This silverback was sitting out in the open, so we were instructed by our guides to sit quietly in a line along the hillside so we could all observe him. We put the people with the big camera lenses closest to him for pictures. He calmly ate bamboo, and HE observed US as well. After several minutes, he seemed to grow tired of just sitting and watching each other, or maybe he spotted something tastier up the hill, or maybe he wanted to prove that he was the higher authority. He got up and moved in front of our seated line giving us all a thrill. Then he stopped right in front of you and me and stepped forward. Do you remember? Of course you do. How could we forget! We started to get up; after all a 500 pound gorilla was approaching us, and we were seated shoulder to shoulder. The guides said, "Don't move." We followed directions and didn't move, but Ndume kept coming. He got to where our knees were touching, then he gently put a hand on both of our shoulders and pushed softly (for a 500 pound gorilla!). We leaned apart for him, and he stepped right between us, his hips brushing our shoulders.... you and me grinning foolishly with glee. A few feet up the hill he turned and sat above us and grabbed some other delicacy to munch -- having either proved his point or having found what he wanted to eat. You're not supposed to make contact with gorillas when you're lucky enough to track and encounter them, but that day that silverback had other ideas. And you know what they say about 500 pound gorillas. Neither of us will ever forget it. I am just sure your readers would like this story, and now I don't have to wait for you to tell it! We finally put up a page about our trip to Rwanda to see Mountain Gorillas. And here's a link to Travels With the Monkey but that was a TOY gorilla! I HAVE been intending to write this story Jamie. Now it's done. That whole trip was a wonderful experience... and Ndume's touch? You're right... something neither of us will ever forget. Hope we have more happy travels together!